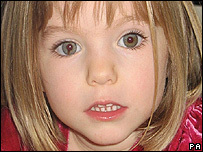 Chancellor Gordon Brown has told relatives of missing Madeleine McCann he will help "in any way he can". Philomena McCann, lobbying MPs for support in the search for her niece, four, said he was "extremely helpful". British suspect Robert Murat, 33, has said he is "a scapegoat". 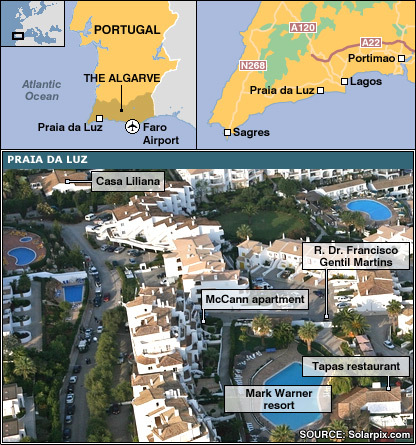 Police have searched his mother's Algarve villa, close to where Madeleine was last seen. A fighting fund will be launched later at the Walkers Stadium in Leicester, to help cover escalating legal bills. Ms McCann, of Glasgow - accompanied by Glasgow Central MP Mohammed Sarwar - said she wanted MPs to use their power and influence to help, and she was not there to criticise the British or Portuguese police. She said Mr Brown had offered support on "a practical and a personal level" in their meeting. She added: "For someone to abduct Madeleine, we're aware they would want such a beautiful, caring little girl as she is, and I can totally understand them. "But give her back, she isn't yours, we want her home and safe." Meanwhile at Prime Ministers' Questions, Deputy Prime Minister John Prescott, who will meet Ms McCann later, said: "I'm sure that the thoughts of the whole House will be with them at this terrible time." 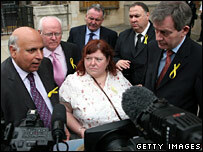 Many MPs wore yellow ribbons that have become a symbol of hope for Madeleine. The family's push to keep the search in the public eye comes after Mr Murat was questioned for 12 hours by police. Speaking off camera after questioning, Mr Murat told Sky News: "This has ruined my life and made my life very difficult for my family here and in Britain. Members of Mr Murat's family have insisted he was having dinner with his mother on the night the four-year-old disappeared. 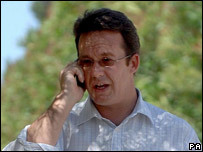 Tuck Price, a friend of the family, said Mr Murat was keen to get the focus "back on Madeleine and away from him". "His daughter is now in hiding in the UK," he added. "The one thing, the compassionate thing, that made him get involved in the case has put his daughter in this horrible position." He said police had searched five houses and seized "various materials" from the properties which were undergoing forensic tests. The suspect has signed an identity and residence statement that prevents him from moving house or leaving Portugal. Mr Murat may have been designated a suspect by police, or he could have chosen to take "arguido" status himself to gain additional protections under Portuguese law.